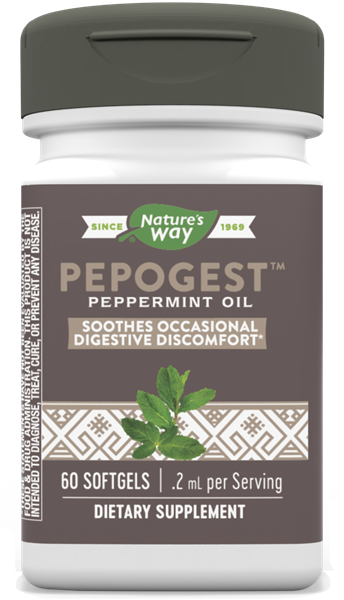 Pepogest (Peppermint Oil) / 60 Softgels - Nature's Way®. Pepogest softgels are uniquely enteric-coated to withstand stomach acid and target the release of peppermint oil directly into the intestinal tract. Peppermint oil is more effective and better tolerated when protected from stomach acid. Take 1 softgel three times daily with water 30 to 60 minutes before food. Discontinue use if heartburn occurs. If pregnant, nursing or taking any medications, consult a healthcare professional before use.